Jotform Cards: How to use the unique name in thank you page? I love that I can pass any parameter to my form and the field corresponding to it will be set automatically. However, I also want to use some parameters in the welcome and thank you texts to make them less generic. In our case we may be using the same form to survey multiple businesses so it would be nice to be able to use the name of that business in the welcome and thank you texts. Currently, you can only pass the field unique name to your thank you page but not in welcome page. Please follow the steps below on how to achieve this. 1. 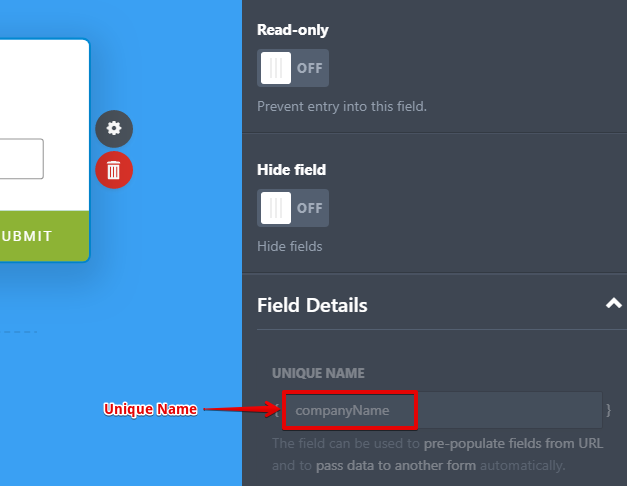 Get the unique name of the field.